The most popular Fire in the Triad dishes are always desserts. Even when the featured ingredient is savory, the highest scoring dishes are always the sweet finishes to the meal. In true Fire in the Triad fashion, below is a recipe from Competition Dining veteran, Chef Michael Harkenreader. The first fried chicken of Fire in The Triad '13: An upscale version of chicken and waffles, this was my favorite dish of the first battle, Poulet Rouge. 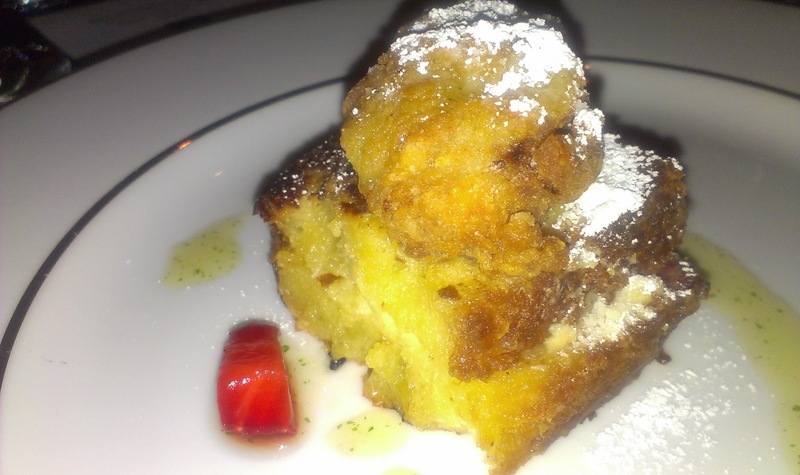 Chef Harkenreader of Undercurrent in Greensboro and his team created this creme anglaise-battered brioche with creamy lemon-scented ricotta, macerated fresh strawberries and a mint-ginger syrup. 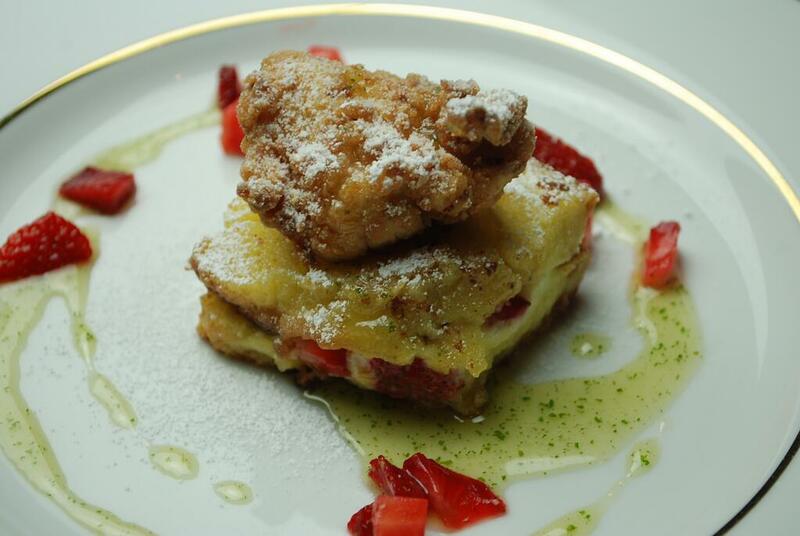 Topped with a crispy chicken poulet rouge tender and powdered sugar, this creation would be a perfect start to a weekend brunch extravaganza. There are multiple components to this dish and are best prepared in the order presented. The key: prepare all of your ingredients first and while one component is cooking or chilling, start the next part. Scald the heavy cream, vanilla and 1/4 cup of the sugar. Whisk together the remaining sugar and egg yolks in a bowl. Temper the yolks with a little bit of the hot cream, then add the egg yolks back to pot. Cook the mixture on medium heat, stirring continuously until the mixture coats the back of the spatula. Strain through a fine strainer and chill. When chilled, pour into a shallow dish or pie plate. Combine milk, heavy cream and salt in a non-reactive pot and bring to a boil. Add lemon juice and zest, reduce the heat and stir until the milk curdles. Strain the liquid in through cheese cloth and let drain for 60 minutes. Add water, honey, sugar, ginger to a pot. Bring to a simmer and let cook for until the pot contents is a syrup-like consistency and is bubbling. The temperature should be around 225 degrees F. Pour the pot into a blender and puree. Add the mint and puree until smooth. Strain through a fine strainer and place the container of syrup in an ice bath to set the green color. In a bowl, add the small dice strawberries, vanilla and add sugar if needed. Set aside until needed. Heat a medium skillet to medium-high heat and swirl in 2 Tablespoons of butter (you may need more later). After the butter melts and the foam subsides, it's ready. Use sliced brioche (for a reliable recipe, click here) or other enriched bread (King's Hawaiian bread is an acceptable substitute). You will need 18-20 slices. Place a ¼ inch layer of ricotta on half the bread slices. Add 1 Tablespoon of strawberries on top of the ricotta and top with another piece of the bread. Press the pieces together so the ricotta and strawberries stay in. Next, dip the bread in the crème anglaise and cook on a griddle. Cook both sides until they are golden brown. Place the French toast on a plate, dust with powdered sugar and garnish with mint ginger syrup and remaining strawberries. Don't forget the crispy chicken tender on top!